Being home to about 17.5 million people, Lagos is the largest city on the African continent and the commercial capital of Nigeria. With its many beaches, the African flair, music and good safety levels, it is the place to go if you wish to discover Africa and do some serious swimming. 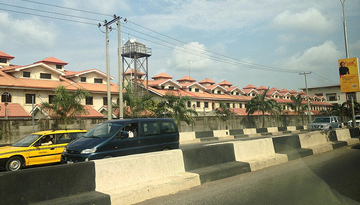 Lagos was originally inhabited by the Yoruba people and conquered by the Benin Empire in the 15th century. The Portuguese discovered the settlement in 1472, and it is them the name Lagos ("lakes") originally came from. It used to be Nigeria's capital (1914 – 1991) until it lost that status to Abuja. Also, the city was a major centre for the slave trade until 1889. In fact, it is possible to visit the ancient slave port of Bagadry Town, which is located only 1 hour from Lagos. This town was known as the "Point of No Return"
Pay a visit to the National Museum of Nigeria if you want to learn more about the different ethnic groups, customs and the recent political history. Another jewel is the Nike Art Gallery with three floors of intriguing art work from Nigerian artists. However, a trip to Lagos should absolutely include beaches – so exchange the concrete jungle with some sand and waves! If you don't want to go too far, check out the Lagos Bar Beach, which basically is the inner city beach. For something more exquisite, you will find the Eko Tourist Resort just 40 minutes from Lagos. 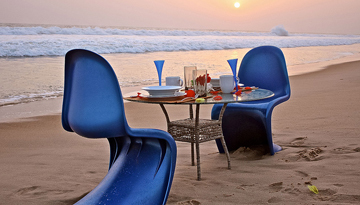 This resort has chalets, restaurants and a conference hall at an amazing beach. Getting around in Lagos is best possible by bus. The the red LagBus lines and the blue NURTW are the most uncomplicated ones. Also, there are car rentals and taxi services available in the city. Due to Lagos' hot climate and rainy seasons, it is best to visit in August and September, when the weather is driest and the temperatures relatively low (usually around 28-30°C). You can compare and book cheap flight tickets to Lagos if you want to make the most of your city break in the fascinating city of Lagos. Best Emirates flights to Lagos from Heathrow with return economy class fares at £529*. 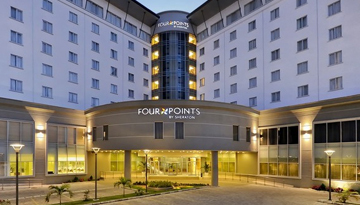 Four Points by Sheraton Lagos offers a deluxe place & modern room to stay in Lagos. Fly from London Southend - New York City & Stay for 7 nights with 4 star accommodation. Include Self Catering.